Mobile Joomla! 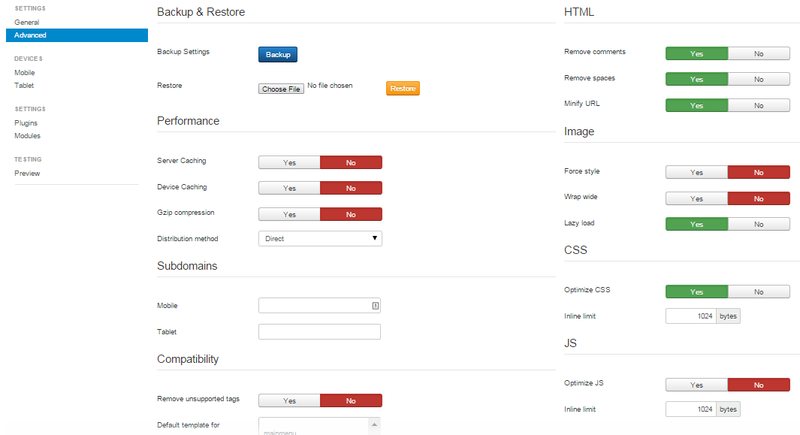 is the best way to mobilize your Joomla! site, displaying beautifully on iPhone, Android, Windows Phone, BlackBerry, Nokia, and all other phones. You don't have a mobile version of your website and you want one NOW. Mobile Joomla! will load different template for mobile devices using your existing content. You have a "mobile-friendly" or responsive template, but you want to speed up your mobile page loads by 100-400%. If you want to display different content or menu items for mobile devices vs. the desktop version, or load different modules or components for mobile and desktop. Download Mobile Joomla! now and get your mobile website set up within seconds! "But I'm running/considering to install Joomla! 3, it IS already optimized for mobile and tablet use... Right?" While Joomla! 3 uses the Bootstrap framework, it doesn't really optimize the delivery of your website data to mobile devices - all browsers have to download the same resources. The page size affects your site's loading time, which greatly affects your mobile bounce rate. Poor mobile website performance can hurt your business, see our infographic for more details. We have analyzed over 2000 Joomla! sites, and estimated that at least 55% of the sites could be significantly improved for mobile. Most of those sites would perform 100-400% faster on mobile by using Mobile Joomla! Instantly creates you a mobile version of your site. Uses the existing content on your website for mobile. Automatically uses your main domain www.YourDomain.com for also mobile visitors. Let's you create mobile subdomain sites like iphone.YourDomain.com or m.YourDomain.com. Reduces your mobile bounce rate and increases your mobile page views by optimizing your site for each mobile visitor's device by resizing and streamlining images and other resources. 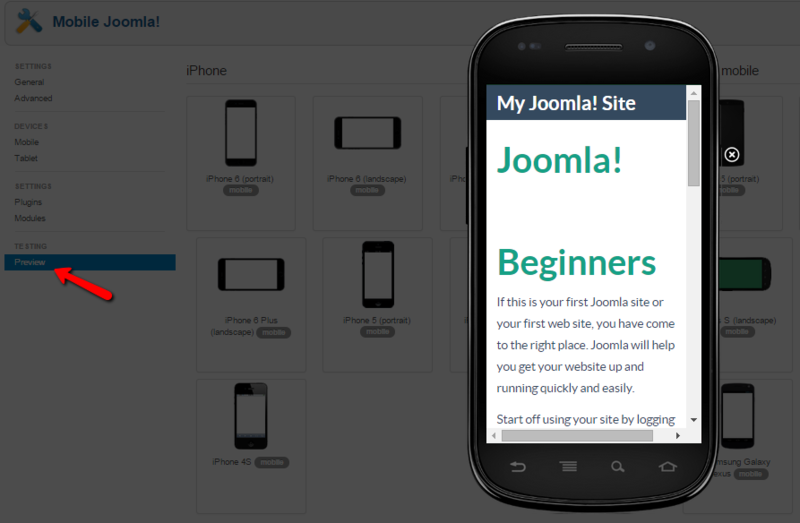 Allows you to use also other mobile templates and responsive templates while using Mobile Joomla! 's powerful optimization engine to boost their performance on mobile. Is fully SEO optimized and implements 100% of Google's mobile website SEO guidelines. Allows you to easily disable desktop-only plugins/modules from mobile views for better user experience. Allows you to show different variations of your content on web and mobile. Let's you tune your mobile site separately for iPhones, smartphones, and feature phones. Supports all Joomla! versions from 1.5 to 3.x. You do not need to be a Joomla! guru to install and setup Mobile Joomla!. Just upload, follow our instructions, and you have a stylish, modern mobile web site! You'll be up and running within minutes. With Mobile Joomla! you do not need to worry about what devices your visitors use: Mobile Joomla! supports them all! Mobile Joomla! ensures your mobile visitors get the best user experience: fast-loading pages optimized for their specific device. Mobile Joomla! ensures the best look and results with its state of the art device detection methods and smart content adaption algorithms to optimize the experience specifically for every mobile device connecting to your site. We have currently more than 20,000 browsers in our device database. Quickly check and tweak your site with built-in mobile simulators. With Mobile Joomla! Extensions, you can tailor your site to perfection and ensure the best results on mobile. Thousands of Mobile Joomla! users have created their own themes. We also have a premium Mobile Joomla! Templates for those who want something very special. "One-click install success!! This module is the best extension I've ever installed and my site looks beautiful on the first phone I checked it against. Fits to the screen, size adjustable and drop down menus all work. Exact replica of the original size. This is definitely recommended! Thanks Mobile Joomla!" "What a fantastic addon! I installed it and there was my lovely looking mobile site. Brilliant. I will be using it for all my Joomla sites." "Pure brilliance. Major thumbs-up to the devs on this one. One of the best extensions I have downloaded over the years. It worked straight out of the box, so easy to configure and works a charm." "Great extension. Very easy to install even for a newby like me. After a few "tweaks" got it working perfectly. Thank you for sharing this." "Quick and very useful. Fantastic component and very easy to use. I had my website in 5 minutes mobile proof. Simple adjustments and my site looks better than ever on my mobile phone." "What an amazing product. Immediately gives any Joomla site a mobile version. Easy to install and works perfectly. When you do get stuck there is great support. I can't believe this product is free. Thanks for this product!!! "Installed and worked without a problem. I was stunned how easy it was to install and use." "This is a great component/plugin. Works out of the box. I recommend this to every one, a must have joomla! component." "Great extension! Very easy to install and works perfectly." "Love it! Thank you so very much! Awesome extensions, super easy to use - took me 30 min from finding the extension, reading the documentation to having it installed & working - no problems at all. Installed your elegance template...Love it too! You've saved me hours of work. Thank you!"